Is an HIV treatment paradigm shift possible? 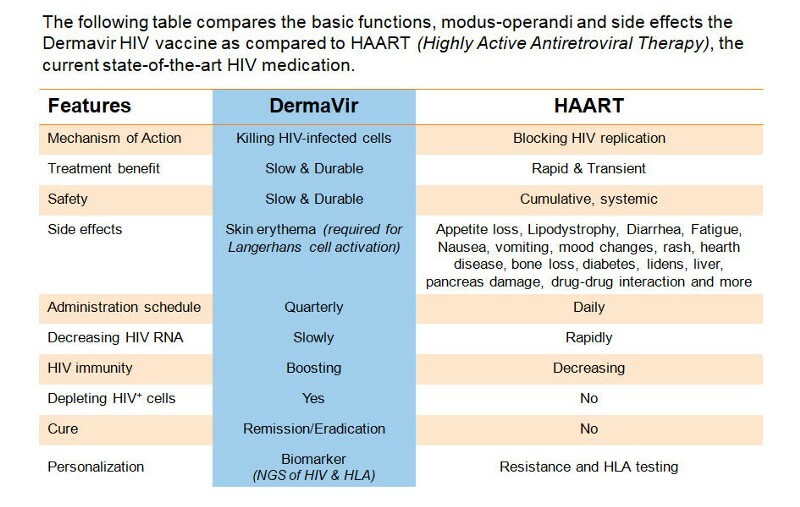 By Dermavir We are a Phase II therapeutic vaccine company with a lead product candidate for the treatment of HIV. Although the HIV epidemic, as we know it today, is thought to have started in the mid to late 1970 we still don’t have medication that is effective in ridding the body of the virus. ON the other hand we have over 30+ million people infected on a global basis, with several different clades of the virus. In 1995 a combination treatment knows as “AIDS Cocktail” was introduced. This type of therapy is referred to as highly active antiretroviral therapy (HAART), combination antiretroviral therapy (cART) or simply antiretroviral therapy (ART). While antiretroviral therapy (ART, HAART, cART) has proven effective in reducing viral count, it does not offer a cure for the disease. In fact ART has its own set of problems. While the treatment itself has advanced, from the need to take multiple pills on a daily basis to the current one pill a day regiment, a patient must adhere to strict daily routine. The pill has to be taken every day for life. ART works by blocking certain processes of the HIV virus, including its ability to replicate (several ways to do this by blocking certain proteins), or by blocking the virus’s ability to so called CD4 cells. The problem is none of these actually work to completely get rid of the virus. HIV remains in the body, often dormant, until it starts replications again. Another roadblock is that ART therapy does not work on HIV reservoirs. While it temporarily gets rid of the virus form the circulatory system (by blocking replication or entry) it cannot combat the disease in the so called HIV reservoirs, located in the lymphatic system. Therefore HIV remains in the body waiting until ART looses steam when it starts spreading again. This is why ART has to be taken daily, to overpower the HIV replication process for a limited time. Adherence to daily treatment is also a problem. Many people simply forget to take their daily meds. Many people simply don’t want to. Adolescents represent another critical patent group — alcohol consumption with HIV meds is not suggested, which can be a problem for young adults. In the most prosperous nation on Earth, only a little over 50% of HIV patients are successfully keeping their HIV viral count under control. What could be the situation in other parts of the world? In comparison, our DermaVir platform may be the first treatment paradigm, if approved, that can successfully increase our ability to really fight the disease. For more information visit our website at www.geneticimmunity.com and don’t forget to sign up to our Initial Coin Offering Whitelist and our Telegram! channel.